Post in Croatia is run by the company Hrvatska Posta. Post offices can be found in almost all villages, towns and cities, and the postal service in the country is actually pretty decent. Rather surprisingly, the Hrvatska Posta website is rather detailed – you can you look up postage costs and delivery times. If you want to send something back home, ask for marke (pronounced mar-keh), which means stamps, or marka (mar-kah) for just one stamp. You will also find stamps sold at the numerous newspaper kiosks and newsagent shops that exist in the country. Once again, simply ask the person behind the counter for marke or postanske marke (which means postal stamps – it is pronounced posh-tan-ske mar-keh) and they will sell you the normal stamps that are used to send small items (letters, postcards) abroad. Alternatively, simply wave your postcard and they’ll probably understand what you’re looking for. In many cases if you’re buying postcards, the shopkeeper will often ask if you want some stamps before you’ve had a chance to ask them! In keeping with the main colour of Hrvatska Posta, postboxes in the country are yellow and are usually affixed to walls rather than being freestanding affairs (as in the UK). They’re quite hard to miss! Alternatively, just pop into the nearest post office to post your item. Ask at your accommodation place (hotel, apartment) for where the nearest post box is, if you’re unable to find one – they may also be able to take in your items and post them for you. 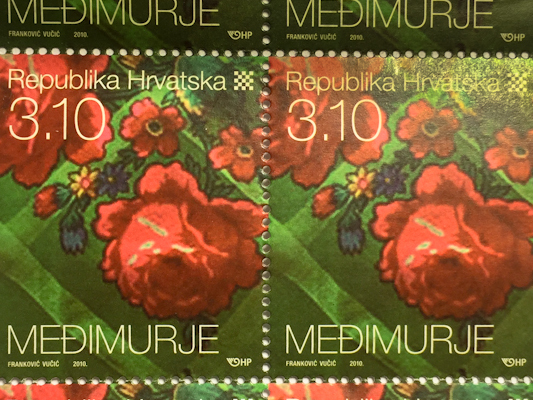 For the 20th anniversary of Hrvatska Posta, the company came up with the rather snazzy idea of issuing stamps with unique QR codes that could then be scanned as a notification that the item being sent had been delivered. You can purchase Croatian stamps (in English, too) on the ePost Shop website.